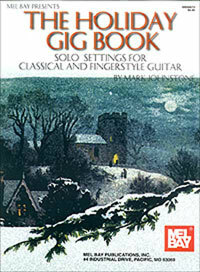 As a guitarist that often does holiday gigs, this book suites my needs quite well! It is a great source of a variety of different holiday melodies (Hannukah and Christmas tunes alike), and it is laid out so that there are no page turns! I use it with my students as the melodies are easily handled by the most beginner of beginners. After Ch. 3 of Mel Bay's method Volume 1, the students can handle almost all of the melodies, and I can play the accompaniment. Overall, kudos to the writer and arranger for creating a thoughtful book that students can use to have fun during the holiday season. I just want to somewhat counteract the 1 star review given by the other reviewer. I am an intermediate guitarist and really enjoy most of the arrangements in here, especially for a beginner looking to improve. He starts out with a particular relatively simple melody, and then adds harmonies to it, and then chords / more harmonies on top of that. So as a beginning guitarist, you can most likely make it through the first third, then use what you've learned for the second third, and finally struggle through and bring it all together for the last part. It has a bunch of christmas / holiday standards, they all sound pretty good, and I have to say this was one of my favorite sheet music purchases. As I've gotten better at the guitar, this book has relatively grown with me, and I've really enjoyed it. I can't speak to its utility as a "gig book" by itself where you're being paid to play (some of the songs are a bit short), but it's a great collection of arrangements, and I would gladly buy it again for $12 if I were to lose my copy. It is a shame I can give this book no stars, however, I will say that if I could give this book zero stars I would. This is potentially the worst Christmas book of guitar music ever published. Not only does it fail to deliver on being a gig book, all of the arrangements are needlessly difficult, but it also contains terrible fingerings. The fingerings, in fact, are so bad that I was convinced that the author was not even a guitarist, much to my dismay, he is a guitarist. The fingerings constantly ask the player to "hop" a finger from string to string instead of using free fingers and or guide fingers to solve difficult passages. The simple fact is that a gig book, especially a Christmas gig book, should be true to the original and offer sight readable material otherwise it is NOT a gig book and should not be published as such. This isn't to say these arrangements are impossible, they can be played, however, they are not worth playing when you get to the meat of it. There are random harmonies placed at odd portions of pieces that make no sense. For example, the third line second measure of "it came upon a midnight clear" contains a chord on the down beat of middle C the D above and the G on the staff, this is a terrible non-functional harmony. It is jarring and halts all momentum of this great Christmas classic. The book as a whole contains example after example of strange harmonies like this which are possibly forgivable if the pieces are easily executed, however, they are not and so any gigging musician would be ill advised to spend time trying to work this up, especially if they are short on time.